Bottles are a big deal at Wines by Design, we try to get the best bottles for you to put your best wine in. However, reusing your bottles is OK also. Just remember that proper bottle cleaning is very important, otherwise the sanitizer can’t do the job you need it to do. There are just a couple of simple steps to keeping your bottles clean. First, make sure that you rinse them once they are empty. This will flush out the last of the remaining wine. Leaving the bottles with wine residue in them will promote the growth of molds and if you miss that little colony on bottling day then they will ruin your great wine. Note: We STRONGLY recommend that you do NOT put your wine bottles through your dishwasher. While this may seem like a great way to sanitize your bottles, you really can’t guarantee that either all of the food particles that may be hanging around the bottom of your dishwasher OR all of the soap that you may (or may not) have used will find it’s way into (and then not out of) your bottles. Then, when the drying cycle kicks in, those food particles (or soap) will harden onto the bottom of your bottle. Neither of these option are good for your wine. As a result, we suggest that you simply rinse your bottles well and allow them to drip dry. Next is storage, you just rinsed out the bottle. Now, let it air dry upside down overnight. This will make sure that residual water and wine will drain out of the bottle and not pool in the bottom. Again, standing water is a hot spot for mold to grow. Last, when you set that bottle aside, why not put it in a case for storage? just make sure you store the bottle upside down to make sure that little spores and dirt stay out of your bottles. Following these suggestions will help the sanitizer do the job it was meant to and it will ensure that you have great wine throughout the batches you make. Remember that we discourage anyone from using twist top bottles. If you want to, you do so at your own risk. 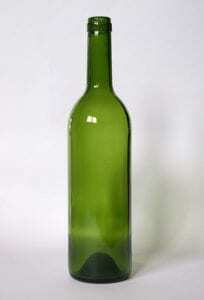 The reason is that the twist top bottles have thinner glass at the neck than cork top bottles. The thinner glass may not be strong enough to withstand the pressure of the cork. The bottle may break as you are corking it or it might happen later in your wine cellar. Either way that is a wasted bottle of wine and someone might get a nasty cut if it happens while you’re corking. That would ruin a good time.